CLINICAL NEED. Soft tissue loss may occur from trauma (ie. 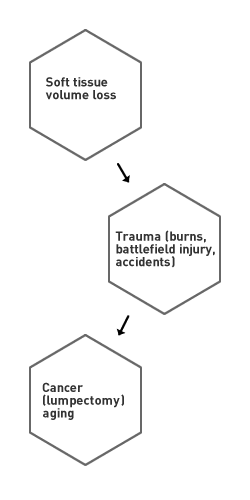 burns, battlefield injury, accidents), cancer (ie. lumpectomy or other resections), surgery, or simply aging processes. The loss of soft tissue is frequently permanent and causes disfiguring depression of skin where tissue is lost, which can not only impact cosmesis but also function. While numerous alloplastic implants or bone fillers are available for hard tissue reconstruction, few medical devices are available today to aid surgeons in the reconstruction or augmentation of soft tissue loss. Adipose tissue is the tissue of choice in repairing soft tissue defects today because of its highly elastic physical properties and tissue bulking capabilities. Current surgical interventions to replace soft tissue yield highly variable results and suffer from donor site loss and inadequate supplies. Aegeria's products are expected to fill the significant clinical need for a simple and effective "off-the-shelf" soft tissue repair technology for small and large volume augmentation. The Aegeria technology provides a natural structure to mimic normal soft tissue and promote new fat tissue growth in a sterile preparation that has been shown to promote adipose deposition in animal models. This novel and proprietary, "off-the-shelf" solution can be used for different applications without requiring a secondary surgical site for harvesting tissue.